On Monday afternoon I did an online chat with these patriotic young people who run Anti-CNN, a website launched in the wake of the Tibetan unrest and crackdown last year by a group of young Chinese who felt that the Western media was presenting a distorted and inaccurate picture of China. They invited me to do the online chat after I interviewed Anti-CNN founder Rao Jin this past Saturday as part of my book research (more on that interview in a later post). My writings and talks have been a topic of discussion on the Anti-CNN website in the past, and given that I once reported for CNN in Beijing, it was not surprising that they were rather keen to offer me to up to their community. Despite their website's unfriendly name, I found the founder Rao Jin and his core group of volunteers to be polite, friendly, smart, and professional, while also very passionate about their point of view. They're keen that the outside world not view them as brainwashed government agents. They want the world to understand that they're doing this of their own volition because they love their country and want their fellow citizens to think more critically about global media. The site is financed by Rao Jin's internet company. He insists that they take no government money. The site has evolved from its CNN-bashing origins last year into a more general forum for media criticism - focused primarily on Western media. They do not, however, subject the Chinese media to the same kind of critical treatment. As Rao Jin said to me: "Our aim is not to challenge the government. We want to create a good space, a good platform where more people have a chance to participate in discussion. If the platform ceases to exist, then there are no voices at all, so first we have to guarantee its survival." Moderator "Leslie" Liu Jing asked questions submitted in advance by members of the Anti-CNN community. Our conversation was videotaped. Meanwhile, as I answered, two volunteers summarized my answers in real time and posted them into the Anti-CNN forum. This morning I read through the whole thing. As one might expect with any "live-blogged" conversation, some details and nuances of what I said were lost, and sometimes the live-bloggers misunderstood what I was talking about. For instance, I referred to U.S. media coverage of Abu Ghraib as one example of how the interests of the U.S. media and government often do not coincide; the live-blogger typed it up in English as "Albert Grey," which I'm sure was an honest mistake. All in all, they did their best to record the substance of what I was saying. That is, with the exception of a couple of things that were completely omitted. When I was asked to give examples of reasons why foreign reporters often don't trust what the Chinese government says, I cited my own experiences in which government officials lied about disaster casualties, and about the fate of people who I knew had been jailed. Those two examples were included. I also cited the fact that - while the exact number of deaths in the June 4th 1989 killing of protesters may be subject to dispute, it's a fact that the government refuses to acknowledge the deaths of many people who I know for a fact were killed - because I've spoken to the relatives of those people, who have proof that those individuals existed, and when and how they were killed. I said the fact that the government won't acknowledge their deaths amounts to refusing to acknowledge these people existed. This was not typed into the forum discussion. In response to a question I also discussed the imprisonment of AIDS activist Hu Jia, but no sign of that exchange appears in the forum, either. The chat session opened with a question about Prime Minister Wen Jiabao's press conference at the closing of the National People's conference. In the press conference he criticized the Dalai Lama, among many other things he said. A community member wanted to know why the Western media seemed to de-emphasize that part of the press conference, focusing on other content instead. I said I wasn't at the press conference and wasn't in China when it happened, and didn't see the full transcript of the press conference, thus I don't remember precisely what Wen said about the Dalai Lama. However if Wen's remarks were substantively similar to things he has said in the past about the Dalai Lama, or a repetition of previous statements by the Chinese government or Xinhua News Agency, the Western media would not have considered it "news" because it wasn't "new." Liu Jing then asked me why the Western media gave less attention to Chinese student demonstrators who came out in support for the Chinese Olympic torch relay than to the pro-Tibet independence demonstrations. I said that part of the reason has to do with the fact that the Western media tends to pay more attention to people claiming to be wronged or oppressed, and generally gives less airtime to people representing or supporting power-holders. I did also acknowledge that Westerners generally don't understand the patriotism of today's Chinese students abroad, the reasons for their patriotism, and the extent to which it's genuinely heartfelt. The next question, from a community member, was whether Americans ever wondered why pro-Tibetan independence protestors appeared at the torch relay. I explained that Americans expect that protesters will appear at events involving a major world power, its leaders, or something representing that country's power. I said that if the Olympics had been held in the U.S. last year and Americans were going around the world doing a torch relay, no doubt all kinds of people would be showing up in protest. China is a world power now, so Chinese people are going to have to get used to seeing people around the world protesting against what China represents. It's part of life as a global power. It's not going to stop and you've got to learn to live with it. That said, I did agree that accosting the wheelchair-bound handicapped Chinese athlete in Paris was a very bad move on the part of the protesters. It showed the protesters' complete lack of understanding (or lack of interest) in how Chinese people viewed their protests. There were a lot of questions about how CNN operates, how it gets its information, and the extent to which media all over the world, including in the West, is manipulated by political and market forces. I talked about how commercial pressures create media bias which can have a political result - because media outlets looking to boost ratings and circulation are sometimes concerned about reporting too many things that make viewers angry and unhappy, prompting them to change the channel or cancel their subscription. I also talked about how it's an undeniable fact that war is good for the news business, and good for many individual journalists' careers, and that this aspect of mainstream journalism has always made me feel uncomfortable. (I've written about some of these things here and here (PDF).) I also talked about commercial astroturfing, as well as blogging by campaign employees - or by blogger "consultants" - which is increasingly part of any Western politician's campaign strategy. My interviewer tried to get me to say that these things are the same thing as the censorship and manipulation that happens in China. I said it's not the same. But at the same time, anybody who is consuming any news from anywhere should not trust it until that news organization or blogger earns their trust. And there are plenty of reasons in any country not to trust any given news source completely. I also made the point that while the Chinese media has evolved and grown more sophisticated over the past couple decades, and while the Internet has created a very wide space for discourse and debate than ever existed in the past, the information environment is still very skewed. Chinese investigative journalists have told me about numerous stories their editors won't allow them to publish. This includes the poisoned milk powder story which a Chinese journalist had been ready to break last spring, but was not allowed to do so - with the result that thousands more babies were sickened, their parents unaware of the danger when they might have been informed. Voices critical of central government policies are censored much more heavily on the Internet than voices of patriotic young people like the Anti-CNN, community. This results in a skewed information environment, reinforcing itself in a positive feedback loop. My moderator said that China's censorship system is a national reality and she believes it's necessary for national stability. I was asked about my 2003 interview with the Dalai Lama. I described how he said he was concerned about human rights abuses in Tibet, and that he was not seeking independence, but rather autonomy. That he wanted to be able to negotiate with the Chinese government about this. Liu Jing asked me whether I had asked the Dalai Lama why he wanted to return to Tibet and "become Tibet's chief slave owner." I said that the Dalai Lama's point was not to return Tibet to exactly what it was like in feudal times. The point was to give today's Tibetans more say in their own affairs, and that his idea was to return as a religious leader, not a political leader. I did not get into a debate with them about historical facts surrounding China's sovereignty over Tibet, as that would have made it impossible to talk about anything else. It was very clear that the folks at Anti-CNN have decided what the facts are, and what they believe the correct version of history is, and that a shared view about these facts is a strong underpinning of the Anti-CNN community. I did suggest that aside from arguing with Westerners about Tibet, perhaps they should do more to engage with Tibetan people, and that the problems in Tibet will only be resolved if more Chinese and Tibetan people engage with one another and try to work out solutions. Liu Jing told me that she has been to Tibet and that in her experience all the Tibetan people she has interacted with say they are grateful for the development that the Chinese government has brought to them. She thinks that Westerners don't understand the real views of real Tibetan people. Reading through the comments posted by community members during and after the chat, it's clear that many community members don't think there's a problem in Tibet itself; they appear to believe that the whole problem is caused by the exile community and by Westerners who are enamored of the Dalai Lama, interfering in China's internal affairs. My purpose in doing this interview was primarily to understand the Anti-CNN community better as part of my book research. Communities of enthusiastic, patriotic young people like the Anti-CNN volunteers are part and parcel of the phenomenon I call cyber-tarianism. It will be very interesting to see how the Anti-CNN website continues to evolve. Rao Jin has plans to develop an English-language platform - with a less provocative, more friendly name - through which his community can engage in dialogue and debate with the English-speaking world. I think it's great that they're looking to expand their dialogue and engage with the world. It's important that the outside world understand that China's patriotic youth, like young Republicans or young Tories, feel that they are acting on their own belief systems and get angry when characterized as brainwashed puppets. It will be fascinating to see how the outside world reacts to these efforts, and how the Anti-CNN website administrators handle conversations that foreigners want to have with them involving events, people, or points of view that Chinese websites are generally required to censor in order to avoid being shut down. A new form of highly networked authoritarianism is emerging in China. Call it “Cybertarianism.” It’s not uniquely Chinese, but understanding how the Internet is mediating the relationship between state and society in China can help us understand what’s happening around the world. Signs of cybertarianism can be found in many countries. A number of democracies have creeping “cybertarian” tendencies, too. This is not a doomsday book, however. There are plenty of things that people around the world can do in the Internet age to expand genuine free expression and accountable government. But first we need to wake up and recognize what’s happening. 21st Century authoritarianism is not your father’s or grandfather’s authoritarianism. It can’t be addressed or understood in the same way. Compared to classic authoritarianism, cybertarianism permits – or shall we say bows to the Internet’s inevitable consequences and accepts – a great deal of give-and-take between government and citizens. Cybertarianism is much more deliberative and participatory than the authoritarianism of the last century. While one party or set of ruling elites remains in control, the Internet enables a broad range of public discourse on matters of common concern. 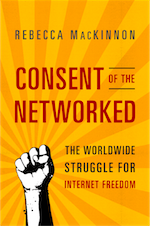 The result is that the average person with Internet or mobile access has much greater sense of freedom – and even potential to influence government policies – than could ever have been possible in a pre-Internet authoritarian regime. At the same time, in the cybertarian state as in the classic authoritarian state, there is no real protection of the individual’s right to freedom of expression. People still go to jail when the powers that be decide they are too much of a threat – and there’s nothing anybody can do about it. It's not possible to organize an opposition party. There are no genuinely democratic mechanisms for citizens to elect a representative government. The courts are not independent of the ruling party.